The Sierra's Mills Creek cirque (center) is on the wast side of the Sierra Crest, sooth o Mono Loch (tap, blue). 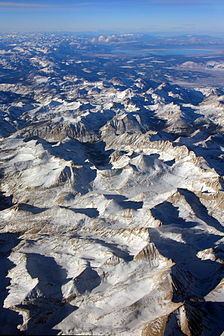 1777: Spainyie for "snawy moontain range"
The Sierra Nevada (/siˈɛrə nᵻˈvɑːdə/ or /nᵻˈvædə/, Spaingie: [ˈsjera neˈβaða], snawy range) is a moontain range in the wastren Unitit States, atween the Central Valley o Californie an the Basin an Range Province. ↑ "Mount Whitney". NGS data sheet. U.S. National Geodetic Survey. ↑ "Sierra Nevada". Ecological Subregions of California. United States Forest Service. Archived frae the oreeginal on 2010-12-05. ↑ "Sierra Nevada". SummitPost.org. Retrieved 2010-05-29. ↑ "The Sierra Nevada Region". USCB Biogeography lab. Archived frae the oreeginal on 2011-05-14. ↑ Carlson, Helen S. (1976). Nevada Place Names: A Geographical Dictionary. University of Nevada Press. p. 215. ISBN 978-0-87417-094-8. This page wis last eeditit on 30 Mey 2018, at 07:17.